We are excited to announce the beginning of our third season of the quarterly Jazz Cabaret at the Mt. Vernon Room at the St. Barnabas Health System. 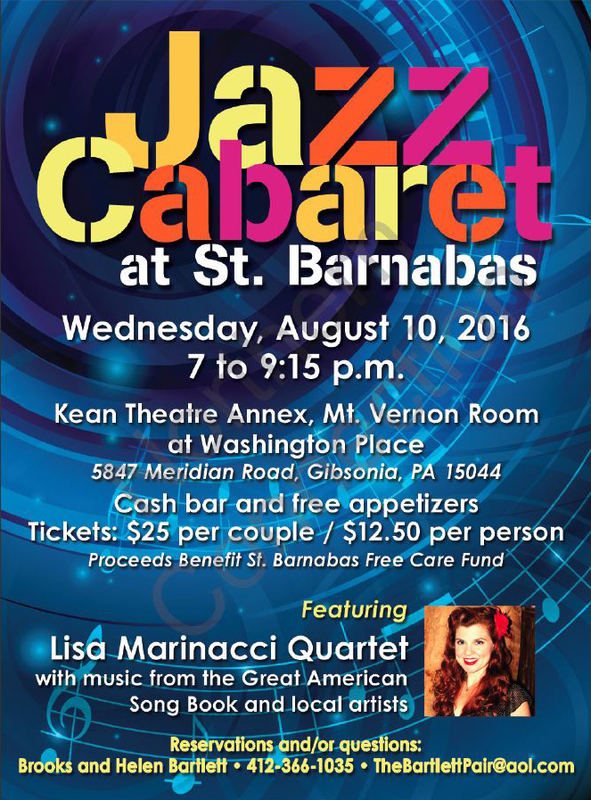 On August 10, 2016 at 7:00 p.m., I will be introducing Lisa Marinacci and her trio. She is an extraordinary lady with a marvelous array of talents – singer, actor, writer, composer, and producer. She began her professional career at age 5 in the Civic Light Opera, appearing with Maureen McGovern. This was only the beginning. She went on to receive many awards, appear in shows in Pittsburgh, New York, Las Vegas, and Hollywood. She used all her talents in these various locations. At one point she returned to Pittsburgh to record her first CD with her friend and mentor, Joe Negri. Lisa has returned to Pittsburgh with her husband and young son. This will be her official debut since coming back to Pittsburgh. She will be accompanied by Joseph Stamerra on keyboard, Pierce Cook on bass, and Tom Early on drums. Please help us welcome Lisa Marinacci back home and start our new season of the Jazz Cabaret. Remember this is a benefit and all monies made on ticket sales go to the Free Care Fund at St. Barnabas. Thank you for supporting jazz and our Free Care Fund. Looking forward to seeing you on Wednesday, August 10.